Dr Jeremy Logan receives an urgent summons from one of America’s most prestigious policy and research establishments, the Lux Institute on Rhode Island. Logan is no stranger to the Institute. He had worked there ten years previously but had been dismissed because some members of the staff, particularly Dr Roger Carbon, didn’t believe in Logan’s work as an enigmalogist. Intrigued by the request, Logan returns to the Institute. When Logan arrives at Lux its Director, Olafson, tells him that one of the Institute’s scientists, a certain Willard Strachey, has committed suicide in the most bizarre manner. It seems that in the weeks before his death Willard Strachey had changed from a mild, good-tempered man to a violent, unpredictable one who talked to himself, shouted at others, and was plagued by voices and devilish music. Olafson asks Logan to investigate the events that drove that Dr Strachey to suicide. Before his death Willard Strachey had been tasked with overseeing the renovation of the west wing of the Institute. The wing had not been used for decades, and Logan soon realizes that the strange energies behind the scientist’s death probably originate from this part of the building. Pamela Flood, an architect who holds the original plans for the west wing, had been working on the renovations with Strachey. Logan contacts her and the two of them have the makings of an ideal couple. Kim Mykolos, Strachey’s assistant, and Laura Benedict, an engineer, also help Logan to unravel what Strachey had been doing in the west wing in which all renovation work has now been abandoned. Logan is not the only person interested in discovering what was going on at Lux. More deaths follow as powerful, shadowy figures try to stop Logan from discovering the secrets of the west wing. 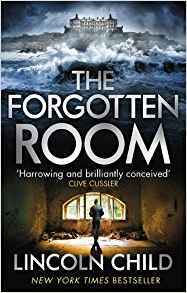 The Forgotten Room is a gripping tale of what might happen when science is misused. Set in a creepy, sprawling old mansion near a rocky shore, it progresses at a deceptively relentless pace. It is ideal for those who just want to curl up with a good book and not be disturbed until they have learnt exactly what is going on: though if you’ve ever thought about renovating a rambling old house, this book might just make you think again. Lincoln Child was born in Westport, Connecticut. Lincoln graduated from Carleton College in Northfield, Minnesota, majoring in English. Discovering a fascination for words, he made his way to New York in the summer of 1979, intent on finding a job in publishing. He was lucky enough to secure a position as editorial assistant at St. Martin's Press. Over the next several years, he clawed his way up the editorial hierarchy, moving to assistant editor to associate editor before becoming a full editor in 1984. While at St. Martin's, he was associated with the work of many authors, including that of James Herriot and M. M. Kaye. He edited well over a hundred books--with titles as diverse as The Notation of Western Music and Hitler's Rocket Sites--but focused primarily on American and English popular fiction. In 1987, Lincoln left trade publishing to work at MetLife. In a rather sudden transition, he went from editing manuscripts, speaking at sales conferences, and wining/dining agents to doing highly technical programming and systems analysis. Though the switch might seem bizarre, Lincoln was a propeller-head from a very early age, and his extensive programming experience dates back to high school, when he worked with DEC minis and the now-prehistoric IBM 1620, so antique it actually had an electric typewriter mounted into its front panel. Away from the world of publishing, Lincoln's own nascent interests in writing returned. While at MetLife, Relic was published, and within a few years Lincoln had left the company to write full time. He now lives in New Jersey with his wife and daughter.